By the grace of Param Pujya Shri Mataji a Sahaj yoga meditation workshop was organised by the Brahmapuri collectivity along with 'At Your Lotus Feet Mother" team of yogis from all over India on 27-28 January 2012 by the side of river Krishna, at Vishwa Nirmal Dham Ashram at spiritually significant, especially for Sahaja Yogis, place of Brahmapuri, Satara in Maharashtra where Param Pujya Shri Mataji had visited a number of times from year 1984 to 1990 and many sakar pujas were held. This workshop was attended by about 800 yogis from all over India and few foreign countries. By the blessings of H.H. 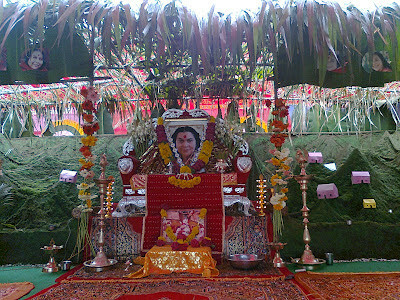 shri mataji.....we had a very beautiful & joyful seminar in Brahmapuri on 27/28/29 Jnuary 2012. We had havana,shri mataji's talks ,musical evenings which the Yuvashakti enjoyed most, 'AT YOUR LOTUS FEET MOTHER' workshop, dances and everything. It was really a great joy to have the 'AT YOUR LOTUS FEET MOTHER' workshop. We all experienced the 'thoughlessness awareness-the nirvichar samadhi' state to which a yogi should be risen. Its really the second day which gave the REAL JOY.....by the blessing of our mother. Each & everyone got something. MOTHER gave the joy of meditation to everyone........ Calling mother from bottom of heart is very important...........U dont have to do great efforts......its the deepness with which we take the name of shri mataji...its important....& suddenly meditation was a very simple thing to do....yogies enjoyed all of this. tried many years but it was hard for them. My experience to this kind of workshops have always been amazing, may it be Amritsar, Nagpur, Mumbai, Bareilly…and now at Brahmapuri. More you taste, more you wish to taste. Everytime for me it’s a new experience on different chakras and a beautiful change in life. During the workshops we pray at the lotus feet of our Mother to take away our problems and try to surrender it completely. Now at Brahmapuri after attending few of such workshops, I felt an immense satisfaction within myself, when during prayers I couldn’t think of any gross problem of life disturbing my system within (which used to be initially), and then I only prayed to Mother for the spiritual growth of self and of others. Towards the end of the workshops, it’s always as if I am completely soaked in the divine nectar showered upon by our Beloved Mother. I have recently attended the meditation workshop at Brahmpuri Seminar. At best thing which i like in the Brahmpuri Seminar is the meditation workshop conducted by you people. I had attended many meditation workshop but this workshop i like most. The best part in this meditation is that it is effortless. All the work on our chakras is done by beloved Mother Shri Mataji. The only mantra which we have is the name of our Mother "Shri Mataji". Some times in meditation we neglect the fact that who is Shri Mataji. Shri Mataji is the Adishakti who knows everything about us good or bad. So if we are surrendering our problems on her lotus feet, only then we will get the solution. I was in total thoughtless awareness during the meditation. I could feel my chakras revolving during the meditation. When the Sahaji who was conducting meditation ask us to pray to mother that "Dear Mother what ever wrong thing we have inside us, please remove it", then i could feel few of my chakras revolving very fast. I am doing this meditation at my home daily and i am getting very much benefit my this meditation. I think this is the only meditation which we have in Sahaja Yoga and this meditation should reach as many Sahaji's as possible. We are sahajayogis from cochin and we are sharing the experience of Shekhar Gharami who works in naval base. I went to seminar in Bramhapuri in january. It was the second day 28th jan. We started meditation with the three Mahamantraras. Saying Shrimataji….Shrimataji….. Shrimataji….slowly all my thoughts were going away and i was going into meditation with the blessing of Shri Mataji. Vibrations were so beautiful that my face was covered with tears coming from my eyes. Then the beautiful face of Shri Mataji came in my mind and one by one She came in Her different forms and I was feeling fragrance too. I want to say lot of thanks to Shri Mataji for this beautiful feeling and I wish to get permanent place at Her Lotus Feet. I had attended this effortless meditation workshop for five times. Every time i attend there is a change within me. This brahmapuri workshop was really awesome and after that i started meditating at home daily and i am feeling very good. After coming from brahmapuri a few people attended online meditation conducted by sarthak bhaiya and it was ultimate. We feel like if we can meditate online once in two days or daily or weekly once, it would be a great change in many sahaji's in terms of meditation. I thank Shrimataji that I was fortunate to be one among the many yogis who had come from all over India and abroad to attend the two days Meditation workshop at Brahmpuri, near Satara in Maharashtra. 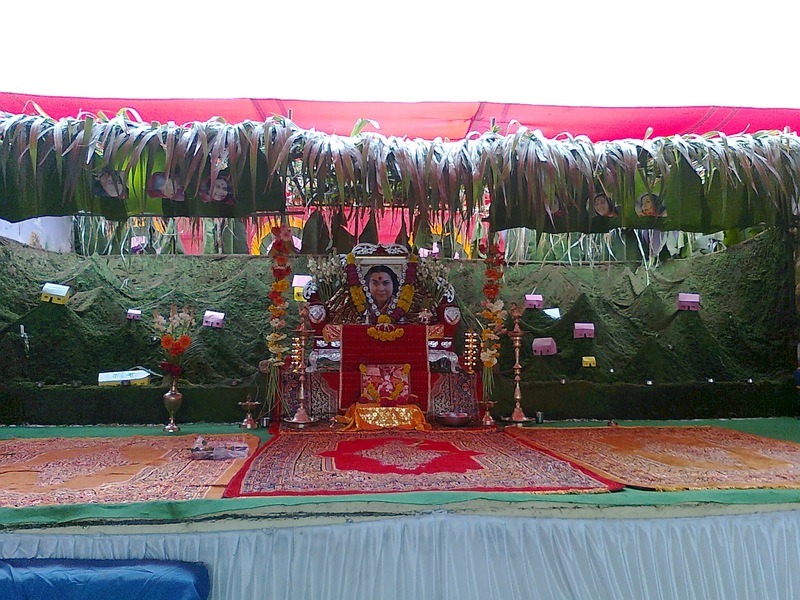 It was a unique experience wherein we could all experience the oneness with all pervading power of Shrimataji, simply by remembering the all powerful mantra “ SHRIMATAJI”, from the deepest core of our hearts. This was the only thing in those two days which we did, bereft of any technique whatsoever. 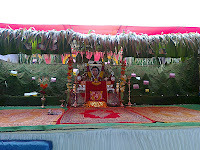 It epitomized into the divine percussion (Anhad Nad ) which was very many times was described by Param Pujaya, Shrimataji as “Shunya Shikhar Par Anhad Bajire”. I, Neelam Rai Nagpaul(Rosy-Nick name) from Delhi-India,56+ years in physical age but only 4 years old in Sahaja life have been growing very slowly but steadily since I started attending local/national and occasionally even international meditation sessions/Pujas/seminars. It has been a journey filled with awe, enthusiasm and often, even disappointment at my own self, wondering why is it that I do not feel what others do, in terms of the flow of vibrations or becoming thoughtless and experiencing the state of meditation like Mother has described. This has been inspite of following tips from various yogis, daily foot soaks/use of ice packs /logging onto online meditations on regular daily basis.My heart has all along been pining to reach it and maintain it during my meditations. Have been fortunate to have attended at least four seminars conducted by the 'At Your Lotus feet, MOTHER' team . As much as I tried to follow their very simple approach, I was unable to reach that state of feeling the cool breeze when meditating by myself at home. At other times, amidst sahaja collectivity I would feel it fleetingly only,if someone deep and mature was leading a powerful meditation session .Someone once even said this to me, "maybe you are trying too hard; just let it happen by itself--spontaneously!" This did make sense theoretically but putting it to practice was maybe not as easy! Today however,I am happy to express that a miracle did happen recently. Early,in the morning of Jan 31st,2012 I returned from the 3 day seminar at Brahmapuri; soon after, did a foot soak along with a clearing session using some mantras. Through out this session , I sincerely tried to keep my attention on MOTHER. Every time it strayed, I reminded myself to bring it back to HER LOTUS FEET. As far as I can remember my earlier individual experiences, I can safely say that yesterday for the very first time , while meditating alone by myself, I felt the cool sensations on my hands, head and vishuddhi areas. My entire being filled with immense gratitude towards Shri Mataji, for this amazing and joy giving experience.I now know what it is like and that it can be actually,easily attained.--'effortlessly' as MOTHER has often explained in so many of HER Talks. All we have to do is very simply,humbly and lovingly ask MOTHER for it, from the deepest core of our hearts. Kindly provide me the details of further meditation programe which will be held after brahmapuri.The meditation programe at brahmapuri was very unique and the same one wants to feel again.